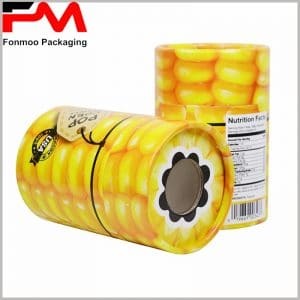 When customizing cardboard tube packaging for products, the most important consideration should be on whether the packaging has its marketing value, whether customers like it at the first glace. As there are many manufacturers for one same brand series, only a unique custom packaging design, through different printing patterns can make it distinguished from other brands. In particular, the paper cardboard tube food packaging, when used for the same tea, different packaging design makes the sales of different brands completely different, excellent food packaging plays very important role for good sales of a good tea. This tea package with green background with tea leaves can hold 150g of tea leaves, it takes cardboard of 350g as raw material, and the tissue paper in dark green. What makes the design of the tea boxes tube boxes packaging unique, is the positive main pattern of dark green clouds. At the beginning of the packaging design the designer decided to take advantage of the anti-marketing psychology, so as to get more consumers’ attention. And things have proved that such a design is unique and successful. In addition to the QR code is printed with ordinary printing tech, the other part, including the main pattern and all the information, are printed with hot silver processing, giving a silver-plated packaging feeling. It is very necessary to label the capacity of 150g, which is the most important concern for consumers and also an important factor for consumers to measure the product’s price / performance ratio. If you want to customize the cardboard tube packaging boxes for food, feel free to contact us. Not only we can provide you with more than 200 green tea packaging, but also the cylinder packaging provided can be used for candy, gifts, cosmetics and more other products.